Taking your baby abroad for the first time can be a fantastic and rewarding experience for the whole family. The key to having a great time travelling with your young one is being organised. We’ve put together our top tips for an excellent trip. Babies don’t always adapt well to changes in diet so make sure to either research whether the milk or baby food they are used to will be available in your destination. If you aren’t sure, it is always best to take a supply with you to avoid any mishaps. Other products that it’s useful to have with you are any lotions or creams they are used to. There are lots of items that you will need when you are away but won’t want to take with you, such as travel cots. You don’t want to be caught short on arrival though so it is always best to double check the availability of items like this before you go. It is also a good idea to look up some reviews before you book to see how child-friendly somewhere is. The internet is great for this with tons of holidaymaker review sites meaning you won’t end up faced with unsafe equipment. 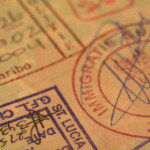 Previously, children could be added onto their parents’ passports but this has been changed. Remember that anybody travelling abroad, no matter how young, now needs to hold their own passport. It can take four to six weeks for a child’s first passport to come through with standard delivery or it can be fast tracked with the one week service. Make sure to apply for this in plenty of time and remember that first time baby passports can not be processed on the one day fast track service. A key factor that delays passport processing is when photos are sent off that don’t comply with the quite strict photo regulations. Trying a service like Paspic can greatly reduce the chance of your baby passport photo being rejected, as 99.5% of Paspic photos are accepted first time. I’m not easily imspersed. . . but that’s impressing me!